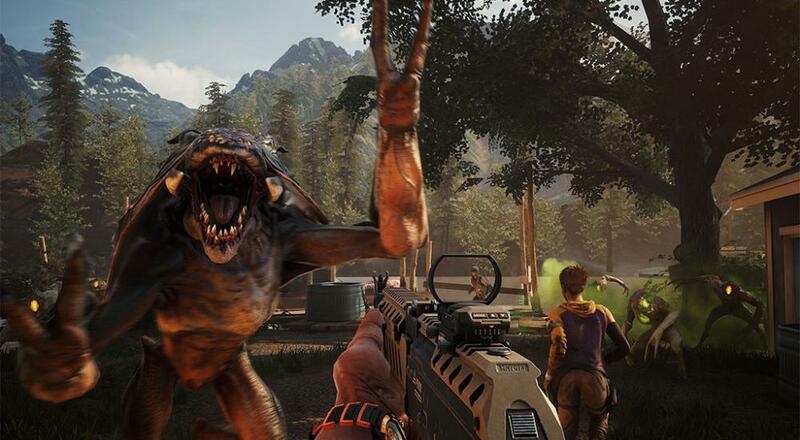 "Left 4 Dead, but with aliens" may be reductive, but it's also a pretty accurate way to sum up what's going on in Earthfall. That said, there are some things that make Earthfall stand out. The enemy sound design and, in a few cases, the enemies themselves are pretty unique. Missions that feature some kind of "hold up here and defend against a horde" objective are particularly interesting/fun and feel like the best cooperative experience. In those cases, you may be provided with things like barricades, mounted/automated turrets, and/or 3D gun printers so you can setup your defenses. It's then up to your team to figure out the best placement of those defenses, whether or not to move them in them in the middle of an attack, and who's setting up where. However, given the unique aesthetic and design of the invading aliens, it's a little disappointing how many of the special enemies are copies of archetypes from Left 4 Dead, such as the "Whiplash" being equivalent to a "Smoker." There are a couple standouts, like the "Blackout" that can teleport and has an energy shield or the "Enrager" that makes normal enemies stronger, but we wish the game leaned a little more in the idea that you're taking on aliens with advanced/different technology. I'll say on a personal front that something just feels off when using a controller on the PC version. The way guns recoil and how sights "jump" when you get hit definitely made me want to play with keyboard and mouse, but it also left me wondering how the title fares on the consoles. If you're looking for a new co-op FPS that pits you and some friends against hordes of enemies as you attempt to complete some set objectives, then Earthfall may be for you. Personally, I'll be curious to see how the planned updates will impact the game and change things up a bit, and you can be sure we'll be playing this again in October once that big update hits. Page created in 0.5458 seconds.